We are eyeballs deep in the process of buying our first home. As a first time home buyer, there’s many things that have popped up that we were not prepared for we had no idea how to buy a house. I wanted to share some of the things we’ve learned along the way to help you find the perfect home for you. 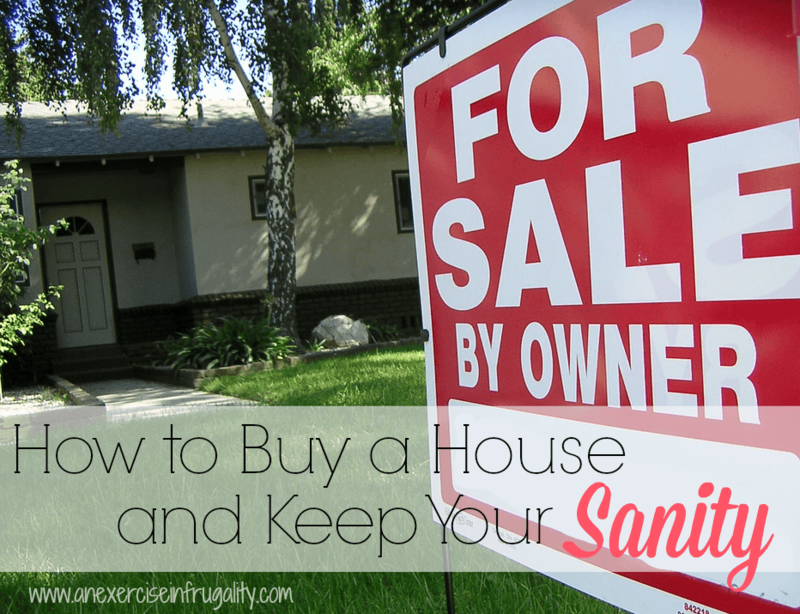 Here’s my tips on how to buy a house without losing your sanity! Forget what I said in the first paragraph. There is no “perfect” home. There’s always going to be something you don’t like, whether its the carpet, the kitchen, or the scary bathroom in the basement. The questions you need to ask yourself are: can you live with it or can it be changed? If the answer is no to both, then move on, but be realistic. Chances are you will have to do SOME things to make the house “perfect” for you. No two people are identical, therefore no two people are going to have identical taste in houses. For the things that you’re willing to concede defeat on, see if there’s a way that can make it work for you. Sure, there may be a weird brick wall or wood paneling in the living room. Can you paint it? Can you jazz it up in some way that makes it unique? Bring a note pad and take pictures during showings of houses you think might be contenders. That way you will have a clear reference when you get home to look over and get a better idea if furniture will fit, and if things will work the way you want them to. Remember that just because there’s 1980’s floral wallpaper in every room of the house, and piles of junk in the back yard…those are not part of the house itself. Try to picture the home vacant, and with painted walls, new fixtures, etc. What I mean is, don’t rule out a fantastic house just because the previous owner’s last redecoration was two market crashes ago. Keep an open mind and try to visualize! We were so excited to find a loan that offers 0% down payment, and our realtor told us that the seller would pay closing costs, so we thought we were all set to move in without paying a dime! NOT how that actually works. Your offer to the seller needs to include what is called “earnest money” which is basically a good faith payment showing the seller you’re serious about your offer. This is dependent on the price of your house, but is going to run you at least $1000 if not more. Then there’s the appraisal and inspection fees. Those are several hundred dollars each! Some of the costs are recouped after closing in some situations, but not always! Its best if you have a chunk of money set aside for these in addition to any down payment or closing costs BEFORE you start looking so you aren’t frantically trying to sell your bodily organs once you have selected a home. When you go house hunting, its important that anyone who will be living in the home (ie: both spouses) see the house before an offer is made. That way there’s no surprises when your husband doesn’t love the 2 car garage with no room for his tools, or your wife freaks out at the teensy kitchen. Also, be careful who you bring with you to showings. While Aunt Margret may be really excited to help you choose your home, her unsolicited advice can complicate things. We brought my husband’s parents to look at houses after we had narrowed down to three choices. We got their input, and compared it to ours and made our decision while considering the points they made. It was great having a second unbiased opinion, but you need to be careful that the choice you make is YOUR choice, and not for anyone else. When you walk in to get pre-approved, they ask you questions about your income, pull your credit, and prod through your financial past. Then they come up with a number. That number is the maximum dollar amount your bank is willing to lend you based on your income, and credit history as well as a few other factors like debt-to-income ratio, etc. The problem with this number is that its NOT an accurate picture of what you can REALLY afford. For example, the dollar amount we were pre-approved for was $100,000 more than we could actually afford to pay. Why? Because the bank only looks at certain debts. They did not count our living expenses like groceries, car insurance, medical bills, etc. This is how a lot of people got into trouble before the housing market crashed. They believed the bank and took on larger mortgages than they could really afford, and when things got tough financially, they had no wiggle room. My income as a blogger is completely unpredictable, and so we did NOT count that as income during the pre-approval process. When you look at what you can afford to spend on a house, don’t start by your pre-approval amount as mentioned in the last point, but rather figure out what you want your monthly payment to be. For us, this meant close to what our current rent is (since we knew we could comfortably afford that amount). Then work backwards, counting homeowner’s insurance, property tax, and PMI insurance (if required). Adjust the mortgage payment so that it is at your threshold when you add in tax and insurance. Then figure out what kind of house you can buy with that payment. Remember to look at the variations in property tax! Don’t buy more house than you can afford just because the bank says you can! Whatever you do, don’t start the “oh, I’m just curious…let’s go see this house that’s outside our price range” game. Its dangerous. Even just browsing them online….I found an a-maze-ing house that was “just” $20,000 more than our budget and it was absolutely gorgeous. It was still well within our “pre-approval” amount from the bank. No problem right? WRONG. The increased cost, plus the property taxes would have meant several hundred dollars a month more than what we could ACTUALLY afford with our other bills. I even caught myself trying to rationalize it to myself and my husband. So bad. Just save yourself the heartache and stick to your guns. You’ll thank yourself later! If things aren’t working out the way you’d like with negotiations, then walk away. You WILL find another home you like. Its a tough decision, but sometimes it’s the one that has to be made. If the seller won’t budge, then take your money elsewhere. Don’t let a realtor push you into something you’re not happy with (that’s part of the reason why we got rid of our first realtor!). You can always ask for concessions-things you want the seller to take care of before you’ll buy-as part of your offer. The seller may decline, but its a great way to open up the negotiations process, especially if the home needs work and there aren’t many buyers looking at the particular home. For one of the biggest events in your life. Buying a house is considered one of the most stressful life events. Make sure to get plenty of rest, try relaxing activities when you can, and work in some fun time with your spouse to ease those frazzled nerves. Read up and plan your moving strategy. There’s some great advice out there on moving on a budget. A careful plan is your best bet to avoid blowing tons of money on your move! So that’s my advice to anyone who is buying a home, especially first-time home buyers. Try not to get discouraged as you go through the process. Don’t get too caught up in the minute details. It is a huge step in your life, try to take some time out to savor your accomplishment! Do you have tips on how to buy a house? OH wow! That’s great advice (although an unfortunate situation for you to be in!) When we were house hunting we had trouble with tenants who wouldn’t cooperate for us to get a showing. We ended up walking away from that house because of it. Our realtor had some stipulations in our contract about they had until X date to do certain things or we could back out of the deal. Thankfully we didn’t need it, but I can see now that things like that do happen. I hope your situation gets resolved soon!